If this product was designed to relieve migraines and headaches, it doesn’t work. 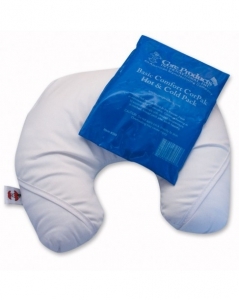 It does feel good I admit, having cold compress on your neck, but it doesn’t do anything for my headache. It was a gift from my boyfriend, and he paid $44 for this. the pillow, but I didn’t want to tell him that his gift doesn’t do wonders like he once described it. The cushion is firm but really comfortable. As a neck pillow alone, it’s great. I just take out the gel pack and I can use it when I want to sleep on the car or a chair. When my neck is feeling sore, I just pop in the gel pack and viola, instant cold therapy. I’ve used this to relieve my migraine attacks, but it doesn’t really work well alone. go away. Although the gel pack does make you feel a little better, it just doesn’t meet up to my standards. He wakes up with severe neck cramps. He takes the gel pack straight from the freezer and covers it with a towel so he can use it on his neck. So far, he’s not returning it. He likes it too much, even though he’s finished with therapy.